Sadly, we know that the last four decades emphasis on church growth produced a net decline in church attendance in America—we need a change in strategy and a new scorecard for success. The good news is that the efforts of the past few years to measure church reproduction and multiplication are beginning to pay off. A new study shows that the percentage of churches plateauing, or in decline, is actually shrinking. It reveals addition growth in a substantial number of others. However, the real kicker is that the percentage of churches planting churches has increased from 4 percent to 7 percent. That’s near double in less than a decade. This is truly cause for rejoicing (and a big thank-you to the folks at Exponential.org who press so hard for this kind of change). A loud “hallelujah” would also be in order. You can download the entire study for FREE at www.exponential.org. A new study from Exponential by LifeWay Research discovered the number of churches reproducing is 7% of Protestant congregations in America. From research conducted by Exponential in previous years, strong estimates showed the rate of churches reproducing and multiplying to only be 4%. This increase to 7% is an encouraging sign that more local churches are embracing a paradigm of multiplication through disciple making leading to church planting. At the same time, Exponential’s mission to see this percentage to move to 10%+, and eventually to a tipping point of 16% and beyond. Exponential developed a simple framework for helping churches think about multiplication. This framework integrates mathematical truths into five levels: subtraction (Level 1), plateau (Level 2), addition (Level 3), reproduction (Level 4), and multiplication (Level 5). 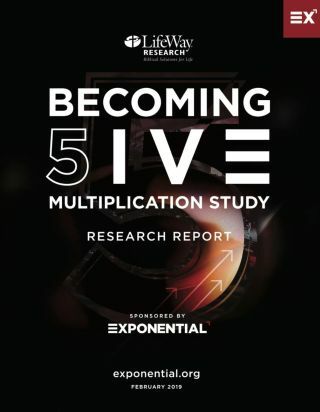 The primary purpose of the Becoming Five Multiplication Study was to measure the percentage of U.S. Protestant churches that exhibit Level 4 or 5 behaviors. This study also helps leaders and researchers understand how these Level 4 and 5 behaviors align with the core context of Levels 1, 2 and 3. Along with the new finding of 7% of churches exhibiting Level 4 (Reproduction), you will discover percentages for all five levels. Download the full report today to learn important insights from this national study along with significant insights across the five levels of churches in America. Next post How Much Ministry Autonomy is Too Much?